Aedes Aegypti mosquito feeding on human blood. This is the species that transmits Zika, and that was genetically engineered by Oxitec using the piggyBac transposon. Photo: James Gathany via jentavery on Flickr (CC BY). In Brazil’s microcephaly epidemic, one vital question remains unanswered: how did the Zika virus suddenly learn how to disrupt the development of human embryos? The answer may lie in a sequence of ‘jumping DNA’ used to engineer the virus’s mosquito vector – and released into the wild four years ago in the precise area of Brazil where the microcephaly crisis is most acute. These ‘promiscuous’ transposons have found special favour with genetic engineers, whose goal is to create ‘universal’ systems for transferring genes into any and every species on earth. Almost none of the geneticists has considered the hazards involved. Oliveira Melo et al draw attention to a mystery that lies at the heart of the affair: “It is difficult to explain why there have been no fetal cases of Zika virus infection reported until now but this may be due to the underreporting of cases, possible early acquisition of immunity in endemic areas or due to the rarity of the disease until now. 1. Many of the millions of Oxitec GM mosquitos released in Juazeiro in 2011/2012 survive, assisted, but not dependent on, the presence of tetracycline in the environment. 2. These mosquitos interbreed with with the wild population and their novel genes become widespread. 3. The promiscuous piggyBac transposon now present in the local Aedes aegyptipopulation takes the opportunity to jump into the Zika virus, probably on numerous occasions. 4. In the process certain mutated strains of Zika acquire a selective advantage, making them more virulent and giving them an enhanced ability to enter and disrupt human DNA. 5. One way in which this manifests is by disrupting a key stage in the development of human embryos in the womb, causing microcephaly and the other reported deformations. Note that as Melo Oliveira et al warn, there are almost certainly other manifestations that have not yet been detected. 6. It may be that the piggyBac transposon has itself entered the DNA of babies exposed in utero to the modified Zika virus. Indeed, this may form part of the mechanism by which embryonic development is disrupted. For some reason, it’s been one of those months where random nonsense suddenly hits mainstream. Here are the facts: there’s no evidence whatsoever to support this conspiracy theory, or any of the other bizarre, anti-science claims that have popped up in the past few weeks. So let’s stop all of this right here, right now: The Earth is round, not flat (and it’s definitely not hollow). Last year was the hottest year on record, and climate change is really happening (so please just stop, Mr. Cruz). And FFS, genetically modified mosquitoes didn’t start the Zika outbreak. The Zika virus is a flavivirus closely related to notorious pathogens including dengue, yellow fever, Japanese encephalitis, and West Nile virus. The virus is transmitted by mosquitoes in the genus Aedes, especially A. aegypti, which is a known vector for many of Zika’s relatives. Symptoms of the infection appear three to twelve days post bite. Most people are asymptomatic, which means they show no signs of infection. The vast majority of those who do show signs of infection report fever, rash, joint pain, and conjunctivitis (red eyes), according to the U.S. Centers for Disease Control. After a week or less, the symptoms tend to go away on their own. Serious complications have occurred, but they have been extremely rare. The Zika virus isn’t new. It was first isolated in 1947 from a Rhesus monkey in the Zika Forest in Uganda, hence the pathogen’s name. The first human cases were confirmed in Uganda and Tanzania in 1952, and by 1968, the virus had spread to Nigeria. But since then, the virus has found its way out of Africa. The first major outbreak occurred on the island of Yap in Micronesia for 13 weeks 2007, during which 185 Zika cases were suspected (49 of those were confirmed, with another 59 considered probable). Then, in October 2013, an outbreak began in French Polynesia; around 10,000 cases were reported, less than 100 of which presented with severe neurological or autoimmune complications. One confirmed case of autochthonous transmission occurred in Chile in 2014, which means a person was infected while they were in Chile rather than somewhere else. Cases were also reported that year from several Pacific Islands. The virus was detected in Chile until June 2014, but then it seemed to disappear. Currently, there is no vaccine for Zika, though the recent rise in cases has spurred research efforts. Thus, preventing mosquito bites is the only prophylactic measure available. The mosquito to blame for the outbreak—Aedes aegypti—doesn’t belong in the Americas. It’s native to Africa, and was only introduced in the new world when Europeans began to explore the globe. In the 20th century, mosquito control programs nearly eradicated the unwelcome menace from the Americas (largely thanks to the use of the controversial pesticide DDT); as late as the mid 1970s, Brazil and 15 other nations were Aedes aegypti-free. But despite the successes, eradication efforts were halted, allowing the mosquito to regain its lost territory. While these mosquitoes are genetically modified, they aren’t “cross-bred with the herpes simplex virus and E. colibacteria” (that would be an interkingdom ménage à trois! 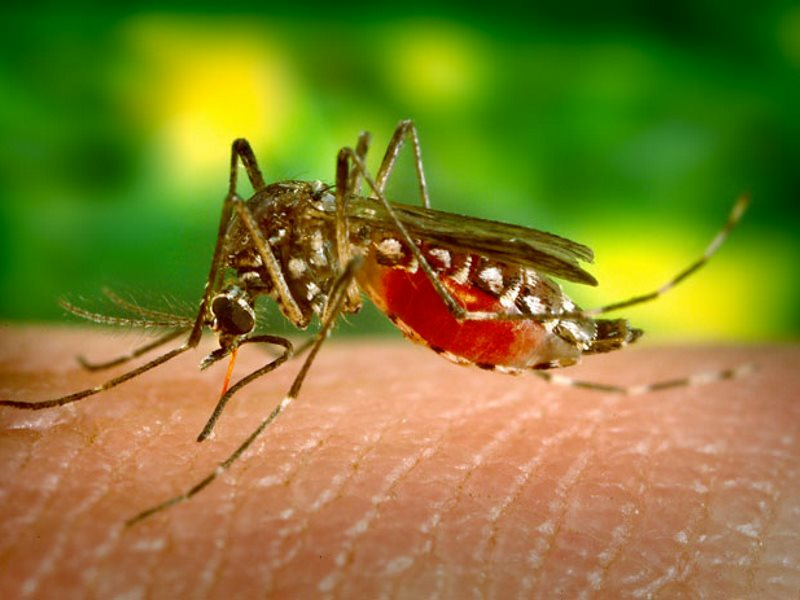 )—and no, they cannot be “used to bite people and essentially make them immune to dengue fever and chikungunya” (they aren’t carrying a vaccine!). The mosquitoes that Oxitec have designed are what scientists call “autocidal” or possess a “dominant lethal genetic system,” which is mostly fancy wording for “they die all by themselves”. The males carry inserted DNA which causes the mosquitoes to depend upon a dietary supplement that is easy to provide in the lab, but not available in nature. When the so-called mutants breed with normal females, all of the offspring require the missing dietary supplement because the suicide genes passed on from the males are genetically dominant. Thus, the offspring die before they can become adults. The idea is, if you release enough such males in an area, then the females won’t have a choice but to mate with them. That will mean there will be few to no successful offspring in the next generation, and the population is effectively controlled. Male mosquitoes don’t bite people, so they cannot serve as transmission vectors for Zika or any other disease. As for fears that GM females will take over: less than 5% of all offspring survive in the laboratory, and as Glen Slade, director of Oxitec’s Brazilian branch notes, those are the best possible conditions for survival. “It is considered unlikely that the survival rate is anywhere near that high in the harsher field conditions since offspring reaching adulthood will have been weakened by the self-limiting gene,” he told me. And contrary to what the conspiracy theorists claim, scientists have shown that tetracycline in the environment doesn’t increase that survival rate. Brazil, a hotspot for dengue and other such diseases, is one of the countries where Oxitec is testing their mozzies—so far, everywhere that Oxitec’s mosquitoes have been released, the local populations have been suppressed by about 90%. The epicenter of the outbreak and the release clearly don’t line up—the epicenter is on the coast rather than inland where the map points. Furthermore, the first confirmed cases weren’t reported in that area, but in the town of Camaçari, Bahia, which is—unsurprisingly—on the coast and several hundred kilometers from the release site indicated. The mistake was made initially by the Redditor who proposed the conspiracy theory and has been propagated through lazy journalistic practices by every proponent since. Here’s a quick tip: if you’re basing your conspiracy theory on location coincidence, it’s probably a good idea to actually get the location right. However, GM mosquitoes weren’t first released in Juazeiro, Bahia (let alone Juazeiro de Norte, Ceará) in 2015. Instead, the announcement by Oxitec was of the published results of a trial that occurred in Juaziero between May 2011 and Sept 2012—a fact which is clearly stated in the methods and results of the paper that Oxitec was so excited to share. Following approval by Brazil’s National Biosafety Committee (CTNBio) for releases throughout the country, Piracicaba’s CECAP/Eldorado district became the world’s first municipality to partner directly with Oxitec and in April 2015 started releasing its self-limiting mosquitoes whose offspring do not survive. By the end of the calendar year, results had already indicated a reduction in wild mosquito larvae by 82%. Oxitec’s efficacy trials across Brazil, Panama and the Cayman Islands all resulted in a greater than 90% suppression of the wild Ae. aegypti mosquito population–an unprecedented level of control. Based on the positive results achieved to date, the ‘Friendly Aedes aegypti Project’ in CECAP/Eldorado district covering 5,000 people has been extended for another year. Additionally, Oxitec and Piracicaba have signed a letter of intent to expand the project to an area of 35,000-60,000 residents. This geographic region includes the city’s center and was chosen due to the large flow of people commuting between it and surrounding neighborhoods which may contribute to the spread of infestations and infections. So not only did the conspiracy theorists get the location of the first Brazil release wrong, they either got the date wrong, too, or got the location of the 2015 releases really, really off. Either way, the central argument that the release of GM mosquitoes by Oxitec coincides with the first cases of Zika virus simply doesn’t hold up. Despite the specious allusions made by proponents of the conspiracy, this is still not Jurassic Park, says Hossain. It’s long past time to stop villainizing Oxitec’s mosquitoes for crimes they didn’t commit. Claire Bernish, The Daily MFail, Mirror and everyone else who has spread these baseless accusations: I’m talking to you. The original post was in the Conspiracy subreddit—what more of a red flag for “this is wildly inaccurate bullsh*t” do you need? (After all, if this is a legit source, where are your reports on the new hidden messages in the $100 bill? or why the Illuminati wants people to believe in aliens?). It’s well known that large-scale conspiracy theories are mathematically challenged. Don’t just post whatever crap is spewed on the internet because you know it’ll get you a few clicks. It’s dishonest, dangerous, and, frankly, deplorable to treat nonsense as possible truth just to prey upon your audience’s very real fears of an emerging disease. You, with your complete lack of integrity, are maggots feeding on the decay of modern journalism, and I mean that with no disrespect to maggots.